Summary: A Midsummer Night's Dream By William Shakespeare is a comedic tale set in Athens where the fairy and human worlds intertwine through tricks and unrequited love as the Duke of Athens calls for a festival to celebrate his wedding to his fiancé Hippolyta. 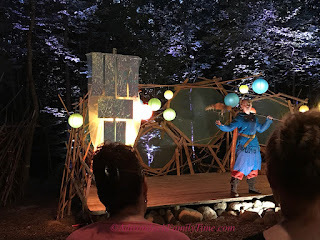 (Saranac Lake) Pendragon Theatre's opening of William Shakespeare's A Midsummer Night's Dream was just that, a dream. Set at Saranac Lake Dewey Mountain's new outdoor amphitheater, this outdoor feast for the eyes starts at the lodge and then transitions through the woods to its magical, wooded location. to celebrate the Duke's wedding. Director Karen Lordi Kirkham, who also plays fairy queen Titania and Hippolyta, has truly outdone herself. 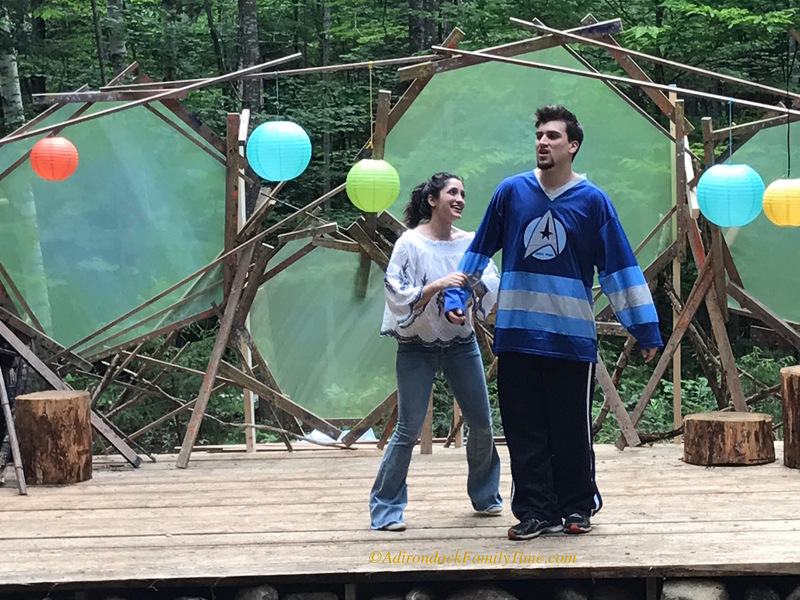 I'm sure there are untold obstacles involved in staging an outdoor performance, but the audience was just treated to a flawless production. The performers are not using microphones so mingle near the audience allowing for the language to be heard at all times. My daughter was apprehensive about attending the show without first rereading the play. She was concerned that she wouldn't understand the language or "get the jokes." I told her to trust the process and know that Shakespeare "done right" is timeless. (Yes, it's a parental victory when my child tells me later that I am right.) 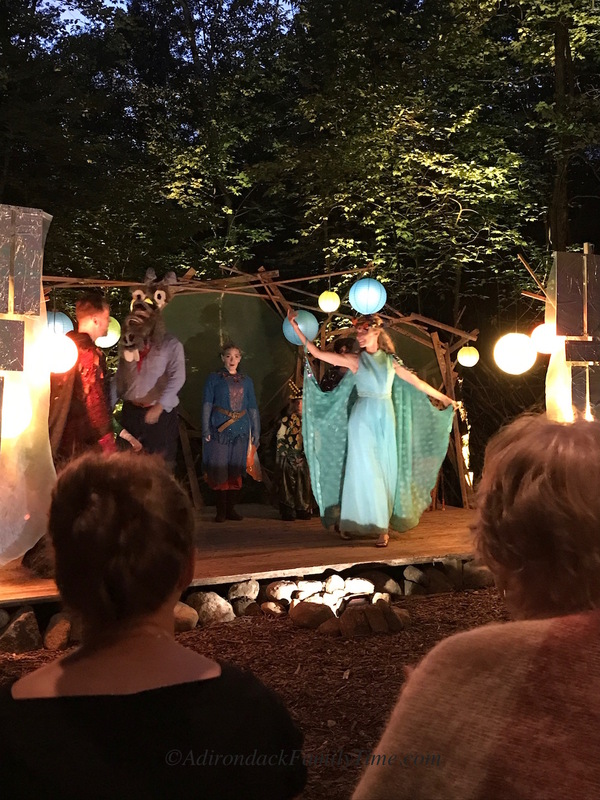 Kirkham has assembled a cast and crew that makes Pendragon Theatre's A Midsummer Night's Dream a buffet for the senses. The play opens with a bicycle riding, paintball game between Theseus the Duke of Athens (Robert Pound) and his fiance Hippolyta (Kirkham) that is soon interrupted when a citizen requests an audience with the Duke. Egeus wishes his daughter Hermia (Rachel Kemp) to marry Demetrius (Lucky Cerruti) though she loves Lysander (Sam Balzac). Hermia's friend Helena (Olivia Zeis) pines for Demetrius, who only has eyes for Hermia. 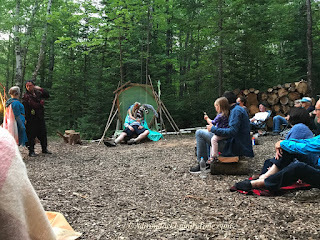 As these lovers ride into the woods, a band of misfits dressed as scouts, lead by Quince (Sean Orman), discuss a play they will perform for the Duke's wedding festival. 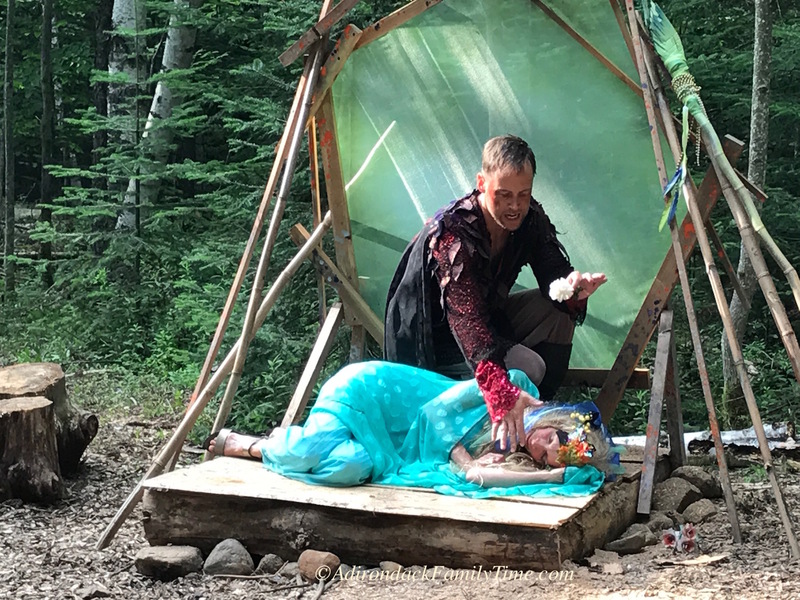 This merry troupe has the audience laughing out loud as Matt Sorensen's Bottom greedily grasps for each role in the play-within-a-play "Pyramus and Thisbe." 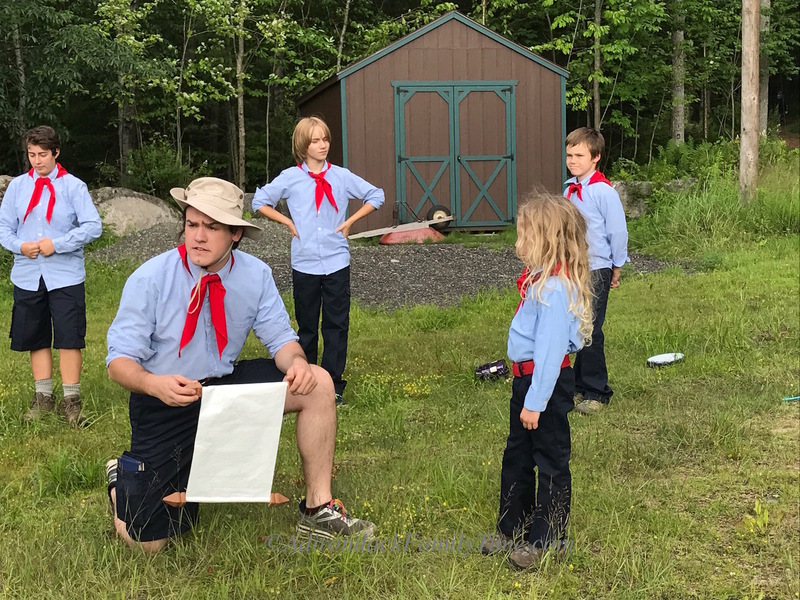 Orman and Sorensen have perfect timing showcasing the children playing Snout (Sam Madden), Snug (Walter Kirkham) and Starveling (Thomas Kline). Having children play those roles and shepherded by Orman and Sorensen was a brilliant move. The laughs flow with an additional "awwww" factor. 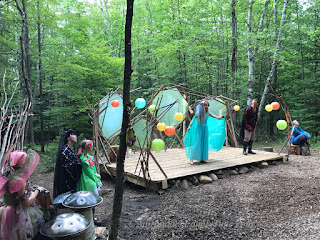 As the troupe marches away, a fairy gestures toward the woods. We stand and follows a dirt path into the woods. Fairies and lights follow us as we cross a bridge and walk about 200 yards to an outdoor amphitheater. 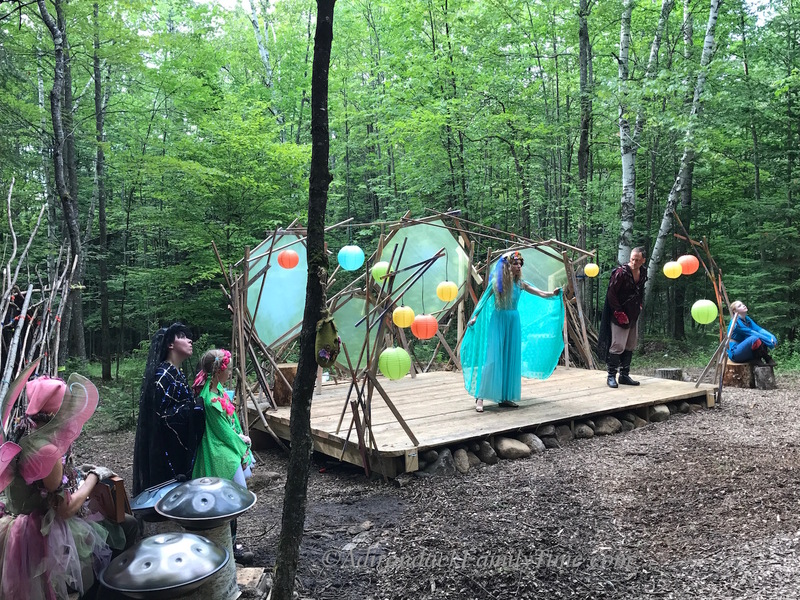 Peaseblossom (Christabelle Kirkham), Moth (Anna Day), Cobweb (Sarah Benamati), and Mustardseed (Walter Kirkham) weave us into their fairy realm. The smell of balsam welcomes us as we enter into the wooded fairy kingdom. The set, lighting, and costumes are perfection. Natural elements hide any production details while Mary Olin Geiger's simple wooden platform stage allows for mystical elements with just paper lanterns and screens to filter light. Kent Barrret's lighting blends with stage elements creating a forest haven. Kent Streed's costumes are rich in texture, dimension, and color allowing fairies to dance and frolic. Janet Spahr's music is ethereal. When Oberon (Robert Pound) wants to play a trick on his wife Titania (Karen Kirkham), he enlists the help of the fairy Puck (Liv Paulson). Paulson's Puck is eagerly mischievous as she readily agrees to to retrieve a flower that when placed on a person's eyes they will fall in love the first person they see. Pound's Oberon is powerful as he shifts between the human and fairy kingdoms. Kirkham is captivating as the fairy queen. The timing, facial expressions, and physical comedy of each actor hands each punchline to the audience. It's a gift to watch the hijinks between the four young lovers, their fairy counterparts and the bumbling villagers. 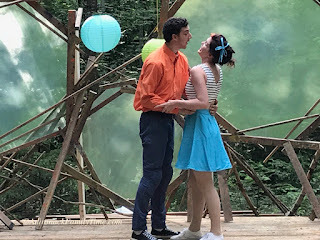 Puck uses the flower to bewitch Lysander (Sam Balzac) and Demetrius (Lucky Cerruti) into leaving Hermia (Rachel Kemp) in the woods. The men are soon fighting over Helena (Olivia Zeis) with the foursome throwing temper tantrums, swooning, mock wrestling, and untangling misunderstandings. When Puck turns Bottom (Matt Sorensen) into a donkey, there are uncontrollable fits of laughter. Sorensen's Bottom is simple and enthusiastic, never questioning the fairy queen's sudden infatuation. The audience oohs, aaahs and giggles throughout the production. Pendragon Theatre's production of A Midsummer Night's Dream is an energetic romp and this ensemble cast provided pure entertainment throughout the whole play. There are plenty of hilarious parts, but to delve too deeply into each actor and character will take the surprise out of watching the production. I love how children can watch this production and be wooed by magic while adults are entertained with the story's frivolity. Enjoy! Warning: Wear walking shoes and bring bug spray (though some is provided) and bring a jacket. The production starts in daylight and ends in twilight so there may be a slight change in temperature. Bring a flashlight if you are uncomfortable walking under lowlight conditions. Otherwise, just enjoy a twilight stroll back to the Dewey Mountain Lodge.